“This Quick Guide will help agencies and facilities develop a comprehensive response to working with lesbian, gay, bisexual, transgender and intersex (LGBTI) inmates. It is not meant to provide an answer to every question or an in-depth discussion of all issues that agencies face or that the LGBTI population faces while in custody. 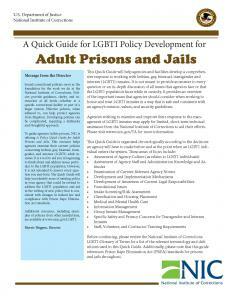 It provides an overview of the important issues that agencies should consider when working to house and treat LGBTI inmates in a way that is safe and consistent with an agency’s mission, values, and security guidelines … This Quick Guide is organized chronologically according to the decisions an agency will have to make before and at the point when an LGBTI individual enters the system. 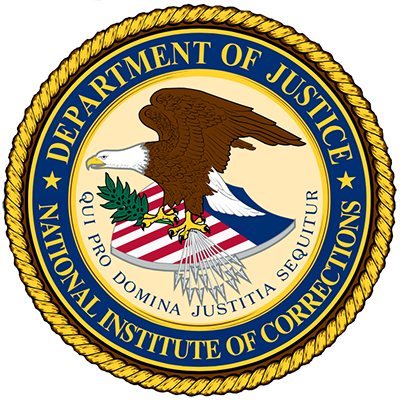 These areas of focus include: Assessment of Agency Culture (as relates to LGBTI individuals); Assessment of Agency Staff and Administration Knowledge and Attitudes; Examination of Current Relevant Agency Norms; Development and Implementation Mechanisms; Development of Awareness of Current Legal Responsibilities; Foundational Issues; Intake Screening/Risk Assessment; Classification and Housing Placement; Medical and Mental Health Care; Information Management; Group Inmate Management; Specific Safety and Privacy Concerns for Transgender and Intersex Inmates; and Staff, Volunteer, and Contractor Training Requirements” (p. 1).